Hammering of the toe describes a deformity of the lesser toes. The toes have two joints in them. If the joint furthest from the toe nail becomes bent, then it can rub on the shoe above it. This can form a hard area of skin over time, or even ulcerate. Both of these are painful. If the toe remains bent for a long period, it can become stuck in the bent position. This is what is known as fixed deformity, and no amount of pulling or insoles will cause it to return to a normal position. Hammering may occur because of unusual toe lengths. If the second or third toe is longer than the big toe, then when shoes are worn, the joints have to bend to allow the toes to be accomodated within the shoe. If the big toe is affected by a bunion, the big toe may ride under the second toe, again causing a deformity. Hammering may also occur as a result of diseases of the nerves or muscles. The toe is sore when shoes are worn, and there may have been an ulcer in the past. The toe may not straighten out, even with force. There may be hard skin over the joint, and sometimes under the ball of the foot. If you have a hammer toe, it is best to see an orthopaedic surgeon who specialises in foot and ankle surgery. You should have x-rays taken in a standing position – this will show if there is any bony damage that has caused the deformity, and also gives an idea of what the best method of treatment may be. Hammer toes are often stuck in a bent position that cannot be straightened without surgery. The operation to straighten them involves taking out the joint that is stuck in one position. The bones are held in a straight position with a wire that sticks out of the end of the toe. This is removed after six weeks. The vast majority of these operations pass without any difficulty and a good result is achieved, but there are small risks of complications. If the toe has been stuck in a bent position for a long time, then straightening it may stretch the blood vessels underneath the bone. 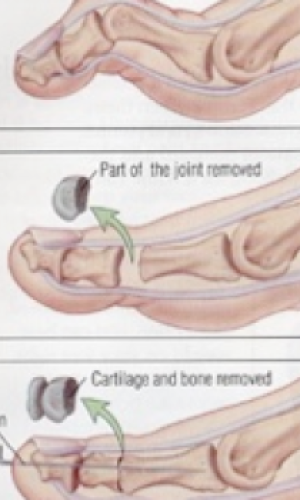 If this occurs, the toe bone may need to be shortened to take the tension from the blood vessels. If this problem becomes apparent after surgery has finished, the wire will need to be removed from the toe to allow blood to get into the end of the toe and this toe will remain a little flail. If the problem is not recognised, the end of the toe may die from not having any blood and turn black. This is a risk of surgery. 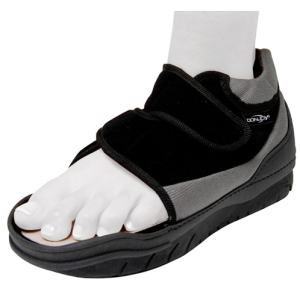 After Surgery, you will wear a special postoperative shoe for six weeks. For the first two weeks, I advise that you wear it day and night – even in bed. The shoe will protect the surgical fixation in the forefoot, and also it prevents the wires from catching on clothing or bedclothes. Sometimes, the wires can be inadvertently pulled out by snagging on bed linen. Some patients continue to wear the shoe in bed for this reason. You can perform exercises on the toe after two weeks by bending the whole toe downwards towards the ground. After six weeks, you will have an xray, and if this is satisfactory, the wire is removed. It is common for the toe, and even the whole forefoot, to remain swollen even after the wire has been removed – it is still continuing to heal. It is normal for swelling to continue for three to six months after surgery.